Over the past several decades there has been an explosion in realized and potential applications of the novel properties of light propagation in complex structures. These advances have been catalyzed by huge advances in material fabrication at the micro and nanoscale, in scientific computation (from hardware to algorithms), and a deepening understanding of the "multi-physics" of such systems. The growing importance of the field of "Optics and Photonics" is highlighted in the recent National Research Council report on Optics and Photonics: Essential Technologies for our Nation. 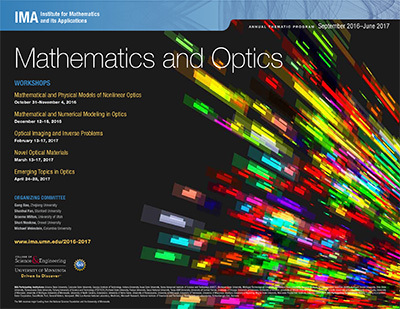 The IMA program on Mathematics and Optics will engage the mathematics community in the full range of questions that arise in the study of optical phenomena, including a fundamental understanding of the governing equations, e.g. nonlinear optical phenomena, metamaterials to PDE constrained optimization problems, necessarily approached via sophisticated numerical analysis and scientific computation. The goal is to launch a thriving community of interdisciplinary researchers working on deep mathematical issues arising in the field of optics.